A stationary bike, or upright exercise bike, will give you the same workout you normally would get on a regular bike. But you can set it up in your home for easy convenience and get a good indoor cardio workout any time. A stationary exercise bike gives you a good cardio workout without putting a lot of pressure or pounding on your knees. This low impact workout will strengthen your legs without damaging your knees. Your average stationary exercise bike will have a solid back in an inverted “T” frame and a front wheel that moves freely when you are pedaling. There are also different tension settings that are similar to shifting gears on a regular bike. By adjusting the settings you can modify the difficulty of your workout. 30 minutes a day of spinning on a stationary exercise bike will provide you with enough cardiovascular activity to enhance your physical performance. There are two kinds of stationary exercise bikes — the upright or recumbent. An upright exercise bike is similar to a regular bicycle. The good thing about the upright models is that they simulate the position you would be on a bike outdoors. The downside is that it puts a lot of pressure on the lower back and groin, that can lead to discomfort or pain later on. In a recumbent exercise bike, you sit in a reclined position with your legs forward instead of downward. This bicycle design is favored by those who have any kind of back pain, especially problems with the lower back. The reclined position in recumbent bikes also gives the buttocks a better workout. Recumbent bikes often come with saddle seats that are larger and cushioned, providing more comfort for the groin area. Stationary bikes have several adjustments so that you can be both comfortable and get the best workout possible. For example, you can adjust the height of the seat so that your legs are only slightly bent when you extend your leg at the bottom of the rotation. When you are pedaling, you should do so in a steady and rhythmic way. As your strength and endurance increase over time, you will also increase the tension on the wheel to make it slightly more difficult. You may have seen some exercise bikes where the handlebars and/or seat move up and down, or back and forth. These were designed to provide an upper body workout in addition to a lower one while spinning. Whether these bikes actually are beneficial is up for debate. It may be best to avoid them altogether as they can cause injury to your back or knees. Since an upright exercise bike does not give you an upper body workout, be sure to include weightlifting for the upper body as part of your training. As with any new exercise program, talk to your doctor so that you can both decide what kind of workout program would be best for you. You will find stationary exercise bikes being sold in department stores, or in stores that specialize in exercise equipment. 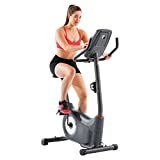 If you check newspapers or online classifieds, you will often see used stationary bikes being sold cheaply that are still in excellent condition. 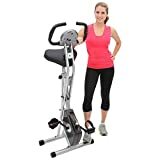 If you decide to purchase a brand new upright exercise bike, you can expect to pay around a hundred dollars for a basic model. 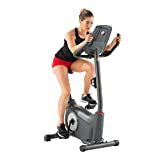 For a couple hundred more you can get a stationary bike that has a digital display with features such as a calorie counter and programmable workout options. If you are into healthy lifestyles and keeping fit, then you probably already own an upright exercise bike. Using an upright exercise bike is an excellent way to burn calories and have fun doing it. To top it all off you are able to do it without ever leaving your house. Upright exercise bikes work similarly to regular bikes, with the exception of requiring you to balance. If you want to acquire an upright exercise bike make sure you find one with a comfortable seat. However, if you end up with a bike with an uncomfortable seat it is possible to replace the seat. Before you purchase an upright exercise bike take some time to ride a regular bike and see if it is a workout you enjoy. The feel of both types of bikes are quite similar and riding one will give you an idea if you will enjoy the other. If money is a concern there are bikes which sell for relatively little money. Some models sell for less than $500 U.S. They are of a lesser quality than the bikes used at fitness centers and gyms but they work and get the job of burning calories done. Obviously, everyone who purchases an indoor bike won’t use it every day. If you are one of those who only needs it for days when you can’t get to your regular workout then the cheaper bikes will work just fine for your purposes. One of the benefits of the more expensive bikes is that they are sturdier, so if you are using it only as a supplement to your regular regimen buying a less expensive model won’t be a problem. One of the features to consider when purchasing an upright exercise bike is the type of resistance it uses. Experts report that magnetic resistance is the best type. Magnetic currents enable you to workout at varying levels of difficulty and give you more options in your workout. Another factor to consider when choosing an upright exercise to purchase is the type of warranty included. Some warranties are more comprehensive than others. For example, some warranties cover the parts against defects while others also cover labor and machinery. Upright exercise bikes are great for those who like to ride but are unable to ride a traditional outdoor bike. They are particularly beneficial for people who need to focus on working out their lower bodies such as quadriceps and hamstrings. Many therapists use them as a gentle way for their patients to recover from injury. Many people enjoy riding their outdoor bike but live in a location that doesn’t have biking trails or the roads are too full of cars to be able to get around. Upright exercise bikes are the answer to this problem. You’ll be able to get the workout you need within the walls of your own home and without worrying about being hit by a car or finding a suitable trail. Some of the more expensive models of upright exercise bikes are quite sophisticated. They can monitor everything from calories burned to heart rate to the distance traveled to the resistance level. Some can even save the results of your workout so that the next time you hop on you can compare and check for improvement. Many of these bikes also offer a variety of workouts and can simulate a ten-mile ride along the coastline or a competitive race. The simulations are great at keeping the workouts fun and motivating. If space is a concern there are models which fold and store in the tiniest closet. These bikes are designed to save space and still work easily. Even if you have to pay a bit more for a bike that can store easily you may end up saving money in the long run when compared to paying for a membership at a gym and the gas money you have to spend to get there. If you are short on space the Schwinn 131 upright exercise bike is an excellent choice. Besides its small size, the Schwinn 131 has many more advantages. First, it is competitively priced — it’s not the cheapest bike on the market but for what it offers it’s a deal. Below are some of the main advantages to the Schwinn 131. As was mentioned the upright Schwinn 131 exercise bike is a good option if you don’t have a lot of room to store it. Upright bikes, opposed to recumbent bikes, are much smaller and require less floor space. They take less room than other types of exercise equipment such as treadmills and weight machines. The upright is fairly lightweight and easy to move around. Although it is lightweight it is still sturdy. This is important because the heavier bikes are generally more stable. You won’t have to worry about tipping over or rocking and swaying when you start pedaling intensely. Heavier machines, like the exercise bikes in gyms, usually last longer too. If a bike sways too much while you are pedaling it will rock internal parts lose and fall apart sooner. That is why the Schwinn 131 is such a good choice — it is light enough to move around and heavy enough to be sturdy. It weighs approximately eighty pounds. Another important feature of the Schwinn 131 is the electronics. Many exercisers become bored when riding an indoor bike because they are in one spot and have nothing to look at. Good electronics make the workout more interesting and allow a variety of workouts so your muscles are being continually challenged. This model has several workouts and resistance levels to choose from so the rider is constantly being challenged. The workouts include eight courses, ten profiles, and sixteen resistance levels. The bike runs quietly so the rider can also listen to music or watch television as they pedal the pounds away. The large LCD display allows you to vary your workout and keep track of your improvement. You are able to track distance, calories, speed, and heart rate. The pulse monitor is built-in and helps you keep your heart rate in the correct range. Many owners praise the easy to see and simple to use display screen. The Vision Fitness E3200 Upright Exercise Bike comes with a large LCD display screen. The intuitive console system allows you to vary the workout with ease. The screen has a blue backlit system which informs you of your speed, time, heart rate, distance, resistance, calories burned and RPM. It also has more than twenty programs which allow you to vary your workout for different purposes. The workout options include random, manual, fat burn, muscle building, aerobic, and watts. The built-in pulse sensor lets you keep track of your pulse by simply placing your hand on the handlebars. This is a great feature which helps you keep the intensity level of your workout in the right range — not too hard and not too easy. The E3200 exercise bike’s programs, adjustable handlebars, and seat make it easy to stay motivated while enjoying a comfortable workout. The seat is adjustable and can be changed for people of different heights. 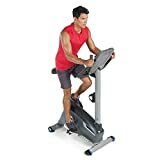 The Vision Fitness E3200 Upright Exercise Bike must be plugged in and has a motor-operated magnetic resistance system. Magnetic resistance systems give a workout that feels very similar to riding a traditional outdoor bike. This type of resistance is also ideal for burning the maximum amount of calories and building muscles. It’s built with 7 magnets surrounding the motor; the motor rotates in the center of the wheel and resistance free of friction. This makes the ride much smoother. The bike also comes with a quiet glide drive train and a sturdy, comfortable upright seat. The seat is designed to provide good back support. The bike is very sturdy and can withstand an intense workout without shaking or vibrating. The seat and the multi-position armrests provide a comfortable, adjustable ride. The pedals are very sturdy and the bike has a self-balancing feature which makes riding the bike very safe. The bike weighs 104 pounds and can support a rider of up to 300 pounds. The measurements are approximately 106 cm high, by 59 cm wide, by 139 cm long.